This 8 lesson course provides theory, application, and practice related to the process of self hypnosis for past life recall and integration. This course involves intense self-exploration and soul-searching and requires a high level of self acceptance and a willingness to surrender current inhibiting beliefs, patterns and behaviors. You will be led step-by-step through the intricasies of self-hypnosis - a practice that can help you in many other avenues of personal development as well. Although this course is best done in eight weeks, learners are encouraged to approach the content in a self-paced, individualized way. One to one interaction with the course facilitator is a primary feature of this process. This course is done completely online from the comfort and privacy of your own home or office. All necessary study materials are included in the course fee, including readings and downloadable documents. A tape recorder and blank audio tapes are also needed to record your personal hypnotic scripts. You may enroll at any time. Upon completion, learners will receive a Certificate of Completion for a 24 hour course. TOTAL TUITION: $99 USD which includes instruction, manual and worksheets. 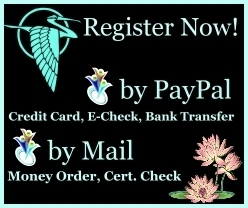 Fee may be paid using PayPal, international money order or certified check.